Like our classic S-Biner, both ends of the S-Biner Ahhh feature sturdy gate closures, making it a multifunctional carabiner that you can use to attach and carry keys, water bottles, and camping gear; hang lanterns and lights; or clip two items together. But we didn't name this little puppy the "Ahhh" for nothing - both ends function as bottle openers, too. That means that when you carry the S-Biner Ahhh wherever you go, you'll always be able to pop open a bottle of your favourite beverage, making you the envy of thirsty people everywhere. This isn't your parent's key hider, but a whole new world of high-quality, waterproof magnetic storage. Featuring two powerful neodymium magnets, the HideOut won't leave you wondering if it's still attached beneath your car. With a watertight seal, this durable magnetic container is perfect for hiding keys and more under your vehicle and around your home without worrying about whether the elements will damage its contents. An included metal plate with 3M VHB adhesive allows the HideOut to be attached to non-metal surfaces, like under wooden decks, plastic tables and more. S-Biner Ahhh Black Bottle Opener Like our classic S-Biner, both ends of the S-Biner Ahhh feature sturdy gate closures, making it a multifunctional carabiner that you can use to attach and carry keys, water bottles, and camping gear; hang lanterns and lights; or clip two items together. But we didn't name this little puppy the "Ahhh" for nothing - both ends function as bottle openers, too. That means that when you carry the S-Biner Ahhh wherever you go, you'll always be able to pop open a bottle of your favourite beverage, making you the envy of thirsty people everywhere. 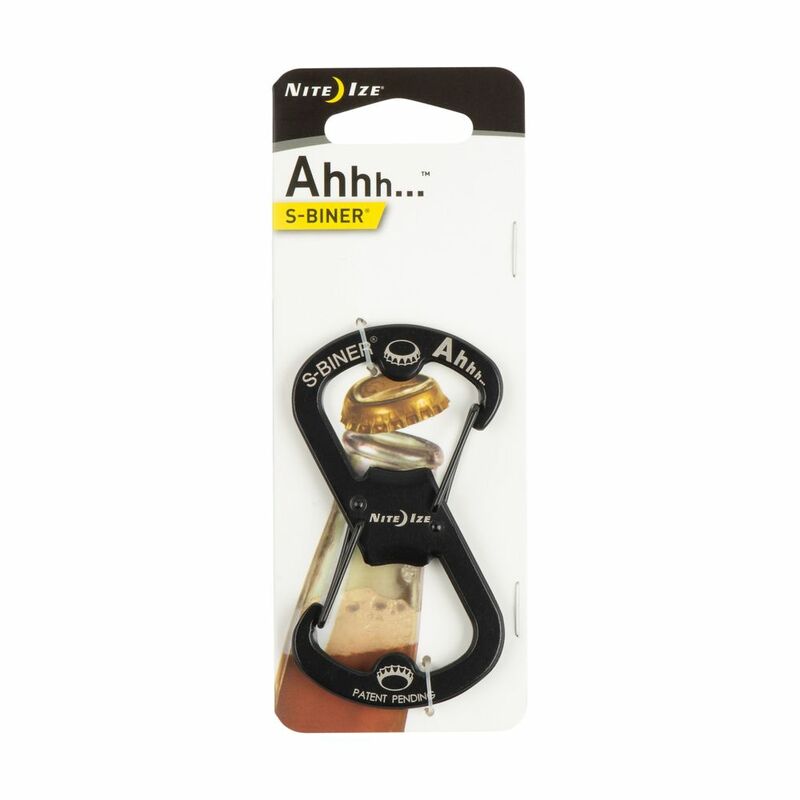 S-Biner Ahhh Black Bottle Opener is rated 4.3 out of 5 by 16. Rated 5 out of 5 by RickSanchez from Useful product I bought this more than a month ago and have been using this product nonstop, not only does it keep my keys all together so I don't go and lose them, but whenever I need to use a bottle opener I have one ready at hand. My cousin actually used the corner of the bottle opener as a screw driver as well.